Set of 3 high-quality, lightweight and durable 7" hand drums produce professional sounds. Raised bumps along the edge. Play the traditional way or run the mallet along the edge for a different sound experience. 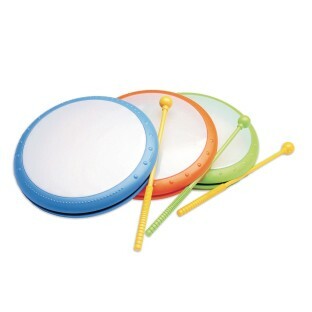 Set of 3 high-quality, lightweight and durable 7" hand drums produce professional sounds. Raised bumps along the edge. Play the traditional way or run the mallet along the edge for a different sound experience. Colors may vary.